For more than 30 years Dynavector has been actively researching how the properties of the magnetic circuits in a cartridge affect the sound quality and performance. This effort has produced cartridges containing many innovations, such as the flux damper and soft magnetism (both of which have been patented), resulting in exceptional sound quality. While digital sound reproduction has advanced, Dynavector has always kept its cartridges one step ahead of the new media and formats. In the case of the original XV-1, the linearity of the magnetic field distribution in the air gap and its further improvement in the XV-1s, created a cartridge with exceptionally rich presence and musical reality. The outstanding performance of the XV-1s gained and sustained a very high reputation with music lovers and the top audio magazines since its launch and over the past several years. 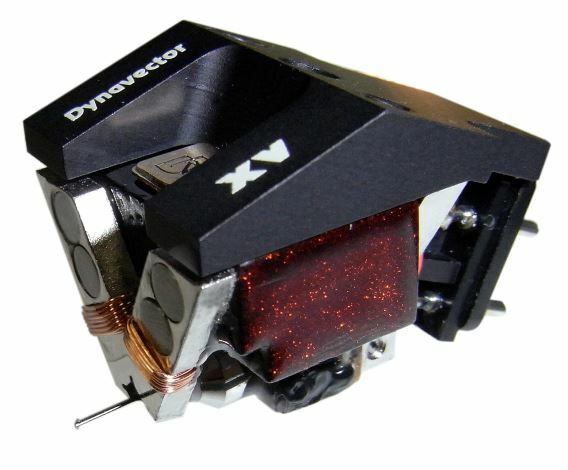 During this period Dynavector has spent considerable time trying to produce a cartridge that significantly advances the performance of the XV-1s; the result is the statement and flagship moving coil cartridge- the DRT XV-1t. The creation of the XV-1t required, not just a closer approach to the ideal magnetic field linearity in the air gap, but also a complete re-evaluation of the materials used in each part of the cartridge. As a result, carefully selected magnetic components made from high cost rare materials such as super high-purity Iron and Alnico column magnets have been employed in the XV-1t for a stabilised magnetic performance. 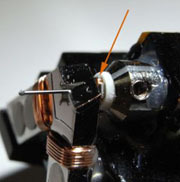 Significant progress in vibration reduction through improved damping of the magnetic circuit components has had a large effect on the tonal quality of the cartridge's sound. 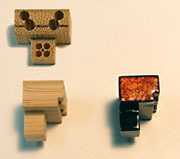 In the XV-1t, Dynavector has selected bamboo coated with Japanese lacquer, which is a unique material for a cartridge, as a replacement for the ebony used in the XV-1s. So how is the sound improved? To paraphrase Dynavector; A silky smoothness is added to the musical reality and natural solidity which the XV cartridges have previously demonstrated and as a result each instrument, performer or group is clearly imaged with a warm and rich presence. Dynavector believe that this emotive musical experience can not be achieved by a digital source and with the XV-1t they have created a "Super-Analog World". 4 Alnico magnets are arranged in the V shape front yoke and the rear yoke, furthermore 4 small Alnico magnets are arranged in a specially designed magnetic equalizer which replaces a standard pole piece. 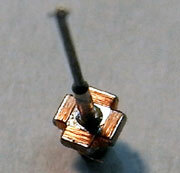 This unique construction of the magnetic circuit achives an homogeneous magnetic flux distribution in the air gap. Furthermore, the front yoke is equipped with a flux damper that reduces dynamic magnetic flux fluctuations that are generated by the motion of the cantilever during the playing of a record. The use of a Boron cantilever with a Super High-Purity Iron armature which allows for the creation of a more steady magnetic field, increases corrosion resistance and a near zero age deterioration process is observed. The unique shape of the armature and the method of coil winding using Dynavectors own specially designed machine, making them the only cartridge producer in the world with access to this extremely refined technique. 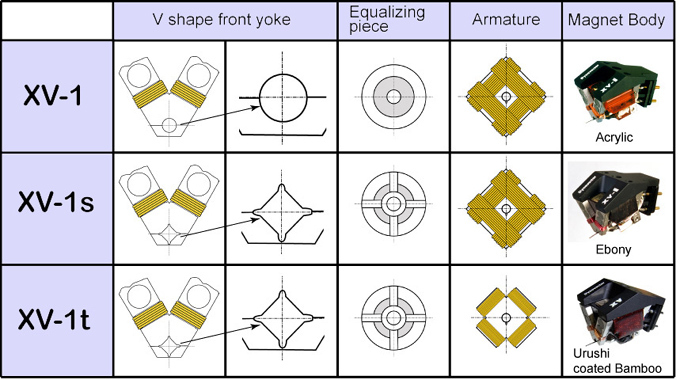 The 16 micron extra fine coils are wound on the surroundings of the outside of the specially machined armature in order to match with square shape holes of the front yoke. The dynamic magnetic flux fluctuation in the air gap can be reduced significantly and the magnetic flux linearity in the air gap is the increased. The high quality Alnico column magnet's dramatically improves the magnetic performance. The crystal organisation of the magnets is arranged in one direction by a special casting method, resulting in the creation of a superb magnetic environment. Precision machined heat treated bamboo coated with japanese lacquer forms the cartridge body. The bamboo fibre used in the XV-1t has the same rigidity of an aluminium alloy but it boasts extremely low weight. Additionally, the bamboo has excellent physical properties as an acoustic material such as a large internal loss and a high acoustic velocity. Dynavector decided to use bamboo for the magnet supported body for the XV-1t. The "t" stands for 'Take', meaning bamboo in Japanese. As a final process the bamboo is coated with a Japanese lacquer (Urushi) to further improve damping effects of the body. These unique materials and their construction contributes significantly to the cartridge's performance.